We all know intuitively that roughness has a lot to do with floor slip resistance. Very smooth floors tend to have low wet slip resistance, and to some types of shoe solings (as on some dancing shoes) can have low dry slip resistance too. However, “rough” appearing floors aren’t always slip-resistant, and this has to do with the character of the peaks and valleys. Roughness on a microscopic scale, or “micro-roughness,” is an aid in assessing wet (but not dry) slip resistance. It is measured in microns, where 25 microns = 0.001 inch. A tiny diamond stylus similar to a phonograph needle (seniors, you remember what they were) navigates the peaks and valleys and the instrument’s computer calculates an average over a given scanned distance such as 0.8 millimeters. It does not necessarily tell the sharpness of the peaks. There are at least three basic forms of micro-roughness relevant to pedestrian traction, as shown in the sketch below. Different surfaces having the same peak-to-valley roughness can have appreciably different wet slip resistance depending on the character of the roughness. 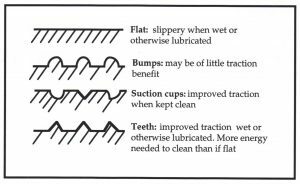 Tiny smooth bumps can give a surface some roughness, but if the bumps have a low coefficient of friction the wet slip resistance of the surface can be low. Here we’re recognizing that there’s a difference between coefficient of friction (COF) and slip resistance. Slip resistance is a result of adhesion and interlock. Adhesion here refers to classic friction between two flat surfaces, and interlock is profile grip between a rough floor surface and the bottom of a shoe or bare foot. “Diamond-plate” metal surfaces include embossed shapes intended to improve wet traction by interlock. Although well-designed diamonds can be an improvement over flat metal, some diamonds have the effect of “bumps” and don’t result in good slip resistance. The problem may be compounded if the diamond plate appears to offer good traction, inspiring misplaced confidence on the part of the pedestrian. This also applies to other flooring surfaces that may appear rough, but are slippery when wet. Including abrasives in walkway surfaces has traditionally been a method that flooring manufacturers and contractors use to improve wet slip resistance by giving the surface “teeth”. These teeth can be very effective in wet or otherwise lubricated situations (for example, kitchen grease, machine oil, etc.). To be effective, though, they must be sharp and durable and must not be submerged under thick coatings. SparkleTuff™ clear abrasive coating effectively incorporates durable aluminum oxide abrasive to give excellent slip resistance for virtually all situations. Sand, used by some floor coating contractors, has brittle points and soon loses its effectiveness under foot traffic. In addition, the size and broadcast density of the sand might be inappropriate, leaving a floor still very slippery when wet. An alternative method of improving wet slip resistance is to make millions of tiny suction cups in the surface, created by chemical treatment. When the suction cups have gentle contours, they can improve wet traction while maintaining cleanability. This kind of roughness is not highly effective in greasy situations such as commercial kitchens. A measurement of surface micro-roughness helps indicate the potential for interlock with shoe soling materials. A peak-to-valley surface roughness of 20 microns or more, measured using the Surtronic 10 or Surtronic Duo profilometer, has been quoted as needed for good wet slip resistance in some situations. Safety Direct America offers this measurement in the laboratory or on-site. The roughness that promotes good wet slip resistance can become worn down, sometimes in as little as a few weeks after the building opens. Safety Direct America offers the McDonalds Restaurants Sustainable Slip Resistance test to assess the behavior of the slip resistance under wear. This test can be done in the field but is most effective when conducted in our laboratory. This test uses decades of good scientific research to determine the DCOF rating both when the flooring is new, and also after it has been subjected to an accelerated wearing. This discussion is adapted from the book STOP Slip and Fall Accidents!, now available for free download.